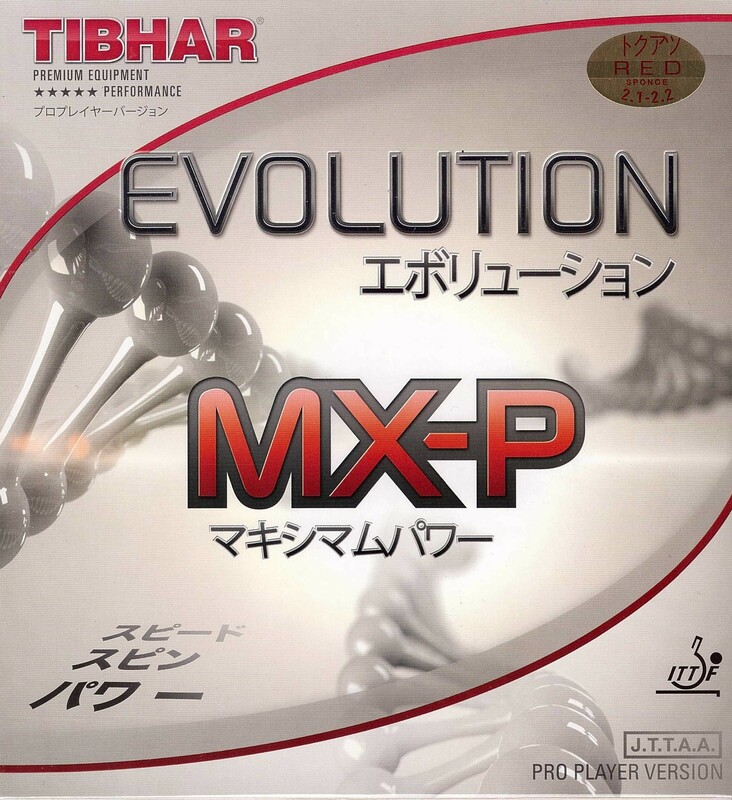 Evolution, the flagship rubber series from TIBHAR. 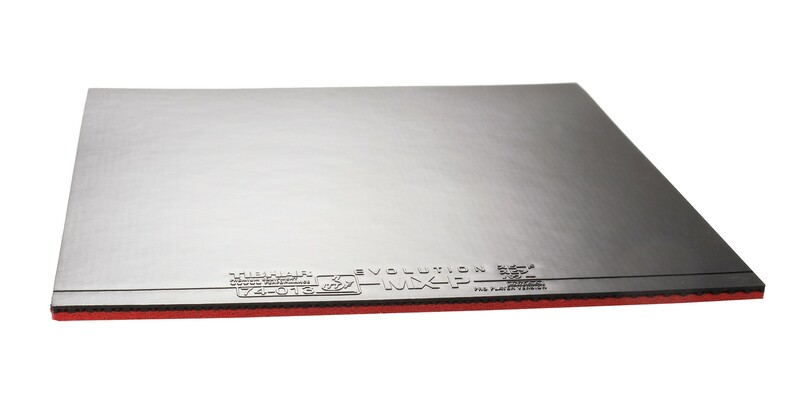 Evolution offers two different categories of rubber types to get the most out of your specific playing style; -S and -P. The Evolution -P line employs a unique, harder rubber mixture resulting in a more solid topsheet. A rubber of this caliber allows for much higher potential to produce more power and energy on your attacking strokes. This helps you hit those winning balls that will take you to the next level! With good technique and fast acceleration, you will be able to reach the maximum that Evolution MX-P has to offer. Having the hardest sponge of the -P series, Evolution MX-P is the fastest and most popular out of all Evolution rubbers. Many of the top professionals can tell you that this rubber is the best choice for a modern aggressive table tennis game. Excellent rubber, better than Tenergy while playing shots, but not much spin . Last long, more spin and control. Good for FH and BH, too. One of the best offensive rubbers on the market. Requires solid technique to be able to handle its speed and catapult, but once you do it excels in every department. Very fast, excellent drive and smash, great spin even with small wrist movement, and good for blocking due to its low incoming spin sensitivity! All has been said by previous users this is a highly aggressive rubber recommended for attackers for offensive play. I use Timo Boll Spirit with 05 and This MX-P what a perfect combination. You will never regret buying this rubber, in fact, I will order it again. I bought this for a friend as a gift to replace his beaten up Tenergy 05 and after two months he prefers this rubber to Tenergy. I hit with it and I believe it is faster than Tenergy 05 with a little lower throw angle but still plenty of spin. I switched to this from the Big T "Energy" rubber that is now costing upward of $70 per sheet. As good if not better, only been using for a month and a half though will have to see how long it lasts still. Very good on both sides. Best FH rubber I've tried (vs Rakza 7/9/X, T05/80/64). I am strong FH attacker and this suits my game perfectly. Have had the occasional issue with durability, edges are brittle, but I play ~5 times per week and considering it's less than half the price of Tenergy on TT11 Buy 4 Pay 3 deal, it's still well worth it. The firmness of this sponge allows me to have the control and power in good balance. The type of density also gives me more options and gears than the Tenergy series. Excellent rubber, a lot of spin, speed and power. Best rubber I've worn in 10 years. Combined with Stiga Infinity VPS becomes a winning machine. Forget to always use any TENERGY after using MX-P. TENERGY are for fools who are cheated by BTY marketing. Buy an MX-P, try it, be happy, and save $ 40 per rubber. High quality product! TT11 service the best! It is the most reliable website in the world of table tennis. Identical to tenergy 05 , easier to execute loops ,open ups ,blocking is also great with this rubber, spin on serves is effortless . Catapult effect is also great such results in an good clearance over net with ball having a decent arc . Hardness 45.5 of this rubber is ideal for far and close to table play .This is my good to rubber plus the price to performance ratio is excellent . Awesome rubber from Tibhar . A great performing rubber. I know allot has been written about this rubber being a substitute for butterfly 05 but this is really a stand on it own rubber. I use it on my forehand in 2.1 mm. Not an elite player but have allot of success in playing aggressively. The rubber provides the extra rebound needed when put on the defensive block. Obviously fast attacks and loops is it strong point. One can develop a good touch on pushes using this rubber with the right racked angle. This rubber is similar to Tenergy 05 FX, but a bit slower. However, it last longer and spinner (in my opinion). It about money saver for 05 Tenergy FX. I love it! The effectiveness of this rubber is similar to Tenergy but the price differential is big. With a hard racquet, this rubber is fast but easy to control. However, if you are looking for better spin, MX-S is slightly better. Good rubber, but in term of durability, it will last only 1 month if use 2 hours daily. Need to boost in order to retain parts, if not, all of the ability. Brilliant rubber, top performance. spin is prominent even on wrist motion, yet alone full stroke. very fast but controlable. one of my favorites. goes well with pretty much any blade, a bit on heavy side thou. sponge is hard but the top sheet is elastic feels softer then other rubber same sponge hardness. limited only by ur tehnique.Briliant! Это отличная накладка. стоит своих денег, и играет почти на любом основании. Требует от спортсмена высокой техники и физики. I have tried a lot of different rubbers for many brands. Although it is not that fast, but it suits me well. Maybe it is because I am not a very skilled player and my techniques are humble, but I'm in love with MX-P.
Суперские накладки, по отличной цене. Сам играю и людям советую. I have used different rubbers and settled for a while on Tenergy 80. This rubber surpasses it. Paired to the Timo ALC blade, this rubber will do everything well. Want spin? No problem! Want killer speed on your forehand or backhand? No problem! Want to do delicate flicks and pushes? Also easily controllable. Truly, a world class rubber. This rubber is so good, fast and also last long. It is great value for money. I would strongly recommend it to everyone to try and use it. This works very much for me, I am not a professional but at my level, I managed to make use of the speed and the control of this rubber. Still want to try the MX-S just to feel the difference. Best rubber I ever played with! Playing well when compared with Butterfly Tenergy. Play almost the same with half the cost. This is a very fast and spinny rubber. If you are an offensive player, this rubber will make a positive change in your game. I have been enjoying it. With the right technique, topspin loops are powerful. Backhand flicks are easy. I highly recommend this rubber. Tablestennis11 is very reliable in getting you good products in a short time. So, they deserve praise too. In love with the control and speed to this rubber. Spin is excellent as well! Very fast rubber. Best for loop and offensive shots. I really like this rubber, very similar to the Tenergy 05 and I find it not sensitive to any incoming spin. Very grippy and spinny rubber. I use this on my forehand with 2.0 mm sponge. Good strength and control. This is the best rubber I have played in my table tennis competition. I would recommend to everybody who loves speed and accuracy . EXCELLENT RUBBER FOR MY BACKHAND. I used Mark-V with Stiga All-Around Carbon earlier. Then combined this rubber with Tibhar Stratus Power Wood for both FH and BH. Got more speed with very little control adjustments. 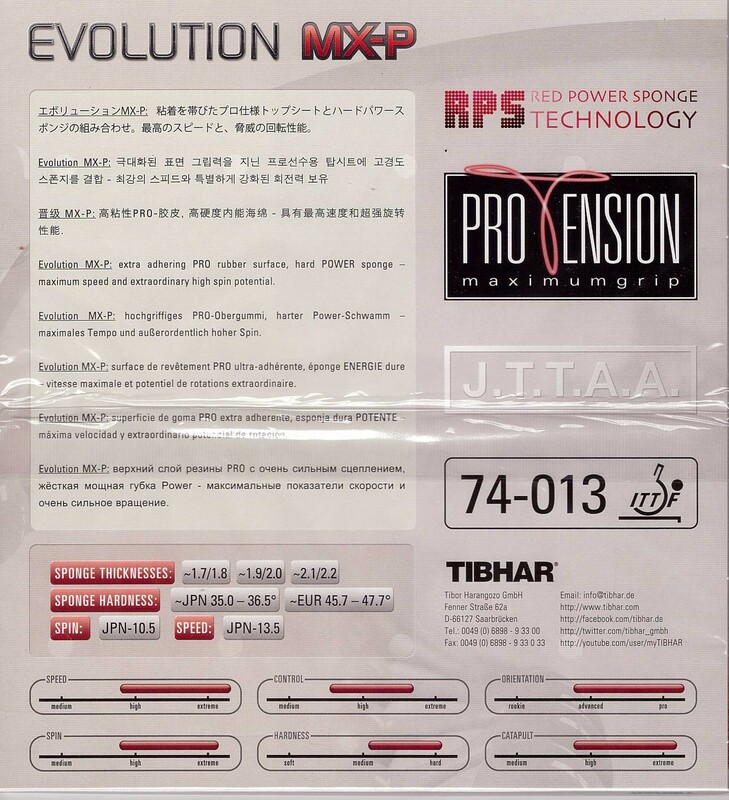 I am using Tibhar Evolution MX-P for forehand and backhand, high performance, high quality, high control, very good speed and spin. Excellent for the players who are playing from long distance. I played table tennis for many decades and always waited for a high quality rubber for a fair price. This is one of them. Superior than the BTY ... More affordable price ... more grip ... I am very satisfied! Want to play better? Want GOOD equipment at a fair price? So this is the Brand ... this is the EVOLUTION line of TIBHAR brand rubbers! I have been trying so many different rubbers and this one gives me the best speed and spin. I strongly recommend it. Good speed, spin, block ability, price. Nothing bad to say about this one. Last long and very good bounce. Very good ember and last long. I played 05 FX before it started getting too expensive. I found the Donic Bluefire M2 was very close to 05 FX. My friend recently recommended me to try the MX-P because it is also very similar to 05 FX. I gave it a try and been playing with it for past 2 months. I really like it because it seems closer to 05 FX than the M2. It has very good spin and good control. I play both on FH and BH. The only downside I see so far is after 2 months, the rubber start wearing out already, it doesn't last up to 6 months like the M2 though. I guess I will have to replace the new rubber every 3 or 4 months. I play only 2 to 3 times a week. Was the choice for my replacement for Ten 05. This rubber is good for loopers, and pushers, it is a bit slower than Tenergy 05 but it more curve on loops and spin. It lasts longer than Tenergy and even it is used but the ability to loop is still better than Tenergy. I love this rubber and strongly recommend to who who loves to loop! Used for backhand on Long 5. Speed and spin are two major advantages. Need to be careful for the control. Maybe better on a little soft racket than long 5 . Another I concerned is weight, plus Hurricane 3 blue in forehand, the combination will be almost 190 gram, which is a little heavy for me. Быстрая накладка, слева очень хорошо играет. This rubber excels in speed and has great spin. The spin requires excellent form to activate. I found this rubber works best for strong fast blocks because of its incredible speed and control. The feel of the rubber is also very high, you can really tell when you hit the ball correctly by how it feels. Mxp is better for looping from middle and more. Harder ten 64. Speed more than ten 64.Spin very good 5*. Block 4*. And prices is #2/5 compare with Ten. That is OK. Satisfy for any person if you are not pro. The rubber is just a beast. It takes time to adjust yourself to this kind of a very fast rubber. I play every day and I was looking to switch from more softer rubber to a more faster one. I wasn't wrong. Even though it took me more time to get used to it, than I expected previously.. I hope it's also a durable one. Once again - I play almost every day between one to two hours. My special thank to Tabletennis11 team. You are just great guys and the service you provide is the first class one. I like this rubber, fast and spinny. I've used Tenergy 80 rubbers in my FH and BH for 2 years and, although they are very fast, I had serious ball placement problems. It all changed with the MX-P rubbers. Now I have lot of control with excellent speed and spin. Particularly, I'm using a MX-P 1.9-2.0 mm for my FH and a MX-P 1.7-1.8 mm for my BH and I couldn´t be more satisfied with my new backhand. The 1.7-1.8 mm rubber gave a lot of control not only for aggressive shot but also for blocking and short game on the table. Very good for forehand stroke drive. Its not better than t05 but the price worth the performance. Red and Black rubbers fitted to new blade, great feel, has enhanced my game, most enjoyable, great fun. quality rubber, has enhanced my game, enjoying it. This rubber is perfect for backhand. Little bit less spin sensitive, compared to Tenergy 64. So recommended for players that have little weakness in returning high spin serves. Tenergy won't forgive, this rubber will. Speed is little bit less than Tenergy but spin is same level. This rubber will improve your game. It has speed and spin that is at the highest level. Great rubber, Good felling and very fast with a lot of spin. For the quality and value of this rubber, I see no reason to ever switch away from using it. I use Max on forehand and backhand. Works very nicely on Sweden extra blade by Yasaka. Before buying Tibhar MXP, I had the Butterfly 05 FX and after using it for 6 months, I can say that they are very similar with the only difference being that the Tibhar has more speed and less control. At the beginning it is a little hard to block, but after 2 days it becomes very easy. It's better than the Tenergy 05 FX. Highly recommended. 27/01/2018 Fast, good spin and excellent control Review by R.K. I love this rubber. Good speed and great control. Low and long trajectory keeps opponent away from the table. I had difficulty playing against long pimples, but not any more with this rubber. Amazing! I use it on Nittaku Acoustic blade. Your 3=4 is a great deal, too. Thank you! Xiom Omega Asia, and finally settled down on Tibhar Evolution MX-P, and Xiom Omega V Pro, but the MX-P is still slightly better for my style because it is a little bit harder than the Omega V Pro, and has better control. The rubber was purchased based on a recommendation from a friend who is a very highly ranked player. It did not disappoint. Отличная накладка, цепкость, контроль, чувство, скорость. Похожа на Tenergy 05, но с более демократичной стоимостью. Very good rubber. A bit bouncy. I've tried in the past Butterfly Bryce, Sriver El, Tenergy 64, Tenergy 05, Tenergy 05 FX, Yasaka Rakza 7. All great rubbers. I like how this powerful and tacky rubber behaves. Fast enough, low throw angle so in my opinion carbon blades are not the best fit (I've tried it on Primorac Carbon and the low throw angle made my life difficult) but works fantastic on my Clipper Cr all-wood blade which provides the flexibility needed to have extra dwell time and let the catapult effect rise the throw angle. In summary try it, it is worth it! Es una goma para ataque constante es difícil controlar pero se puede eso depende el nivel del jugador, goma dura con harto Spin, la duración no es buena aproximadamente 2 meses. I have played with all Tenergy rubbers, all Xioms rubbers, different Chinese rubbers, and I found out the Tibhar Evolution MX-P is the best. It’s not as bouncy as the Tenergy ( so you have better control) but it is not slow at all. Best substitute for the Tenergy with a cheaper price. I have just tried this rubber for a few sessions. Seems to be good rubber with good speed and spin. Not using long enough to say about the durabiilty of the rubber. use wooden blade only. the rubber will now do all the action. It was one of the cheaper tenergy alike alternative that i have came across. Good rubber but not excellent as expected. Really don't like the catapult effect since the topsheet way too soft. Msx is much better product for full stroke techniques. Good control, speed. Spin is OK for ESN or Tensors but less than Chinese rubbers. Has medium to low throw. Top sheet is grippy but not tacky. Good for flat hits, blocking. Throw angle not high enough to my liking for looping. Good for driving though. Good for back hand. Durability is average. I originally got the 2.2mm MX-P and learned the hard way that I wasn't good enough to use such fast rubber. But the spin it produced was just too much to try different rubbers. I opted to drop the sponge thickness down to 1.8mm and I couldn't be happier. That extra control has definitely made my game a lot better. My backhand loops and drives which before tended to go long now hit the back edge of the table and setup excellent forhand attacks. I still struggle a little when it comes to chopping away from the table. This rubber is still fairly fast and springy and a small lapse in concentration can see the ball fly long. Intermediate level players can definitely use this rubber but it's not very forgiving. If you make small errors, it will punish you. I had been used Tenergy for years, Mark V and Striver before that, now with MX-P I can do more with my forehand loop, more arc and control on the table. The only thing is the speed is reduce a bit compare to Tenergy 05 or 64 but I have more spin and arc on MX-P. I recommend to my colleague in my club, they love it, too! This is an excellent rubber with good speed and spin. The control is also good.I highly recommend this one. This rubber is bouncy, but it has great spin. The ball goes into the sponge very easy. Nice control when I use a lot power. Recommend MXP for forehead. It is also good on backhand with viscaria as Lin gaoyuan does so. I was using Nitaku Fast Arc G-1 before this, so I can tell this is quite a bit better than G-1. Power looping and smash are very very fast. Slow and short loop are easy too, maybe because of the gripping that it has. Will see if it will out run G-1 on the lasting part of it. I am highly satisfied with this rubber. This rubber has good speed and great control. I cannot comment on the durability, as I have only had it for about two months. I love this rubber! wonderful spin and speed!! Previously used Tenergy 06 but my loops were such a high throw. Looping for me with the Evolution MX-P is just perfect. I really feel like I have much better control with this rubber and the touch is great. Make sure to use edge tape as the rubber tears easier than most. excellent build quality. good spin, good control,good speed, good feeling. Lower and longer arc than t05 I think. I use it on backhand, forehand is DHS Nittaku Neo hurricane 3, on Stiga carbonado 45 and 145. The first day I use it, my backhand already got better. I feel its more solid than 05, similar spin, better spin feeling and control. Excellent rubber.I also use MX-S a little bit harder.Both excellent rubbers from Tibhar not ENS product but Japanese made with great feel. Lively and grippy out of the package. It is awesome during the first few sessions, making the player feel like he's in god mode. One of the testers said he couldn't believe the shots he's making, and wasn't sure whether he can repeat the performance consistently. It's thAt good. It's performance degrade over a two to three month period, and while still a good rubber at 3 months, it doesn't promote god mode any more. Boosting with one layer restores the rubber a little bit, but not all the way back to new status. This until now is the best match for my timo boll alc, never fails my spin and control near and mid distance games. Highly recommended! Read too many reviews being very popular as a Tenergy alternative; It was almost difficult to select between this and Victas V15, until I watched a video from TTDaily Dan with Paul Drinkhall and finally went ahead and paired it with Nittaku Septear Blade. Went ahead and ordered 4 more. This is one of the best rubbers for fh. It gives a perfect combination of speed and spin. It has a very good tackiness and feeling. Tenergy like. Feels and touches are precious! Won my matches and gave me silver! Thank you. I got 2.1mm on both sides on a Nittaku Acoustic blade, and find it to be very good. I almost cannot tell it apart from a T05 on a Viscaria blade, quite often it even feels better. I use a 2 mm for forehand drive. Powerful yet controllable. The best backhand and forehand rubber. Excellent rubber. I was accustomed to play with tenergys and decided to give a chance to this much talked rubber. It really surprised me. I pasted it on a 7 all wood and simply found it very good, but it was when I pasted it on viscaria blade that I realized how good it is. I loved the feeling, very fast and with a lot of spin. Control is a lot better than 05. The arc ia a bit less than tenergy. Thank you TableTennis 11. I've tried many of the newer kinds of rubber and I have to say MXP works the best for me! It can create huge amounts of spin on serves, pushes, slow loops, fast loops. It really shines though in fast topspin loops and counter looping. It's an awesome rubber for FH and BH! Very fast rubber ,good price! I'm using this rubber on my backhand. Good spin on my serves. Good blocking close to table. Good smashing from mid distance. I was looking for the powerful fore-hand rubber and Evo MX-P is meeting all qualities of the F-Hand rubber: very powerful, it is fast and generates very good spin. I can control it very well, and pushes are working for me too ( I am not a good pusher but do not have issues with MX-P) I have it on Andro Treiber Z for several weeks now, and MX-P shines in loop-to-loop and active blocks. Esta es mi rubber de cabecera para mi reves es la mezcla perfecta entre control potencia y spin. Muy recomendable. Exige bastante tecnica. Fast, spinny and requires a lot from you. Better after some days of playing. Not exaktly same as T05, but the same requirements from you as a player. Like it! For me MXP is similar to Tenergy 05/80 series, even faster than 05. Yes indeed tenergy05 is more spinny, but only a little. You can buy 2 mxp here for teneregy price in Russia for example. Кто ищет замену тенерджи из-за их высокой цены, я рекомендую МхР без вариантов. При чем это действительно альтернативная накладка в сравнимых с тенерджи характеристиках, а не бюджетная малопохожая замена. MXP/MX3 combo on Stiga Intensity NCT. Very good blade/rubber combo for me with good power from mid table. Excellent ball feedback and control. MX-P is a great fast and spinny rubber. I was using Tenergy 05 and found MX-P as a viable alternative. It is faster than Tenergy 05 and I actually found it a bit too fast for my play so I am now using MX-S which is a perfect match for me. I will likely go back and play with my MX-P's again when I can control/cover the ball better on my backhand. Speed is good but lacks spin. Control is also very good. If you want to rely on purely on top spin then dont go with this. Donic would be preferable. But if you want control(blokcing) and attack then this would be a great rubber to play with. Stays sticky and tacky for a long time. I play everyday and it still has good spin (FH max thickness). 3-4 months of everyday play and practice. This is a control rubber, similar to Tenergy 05, but cheaper. I use it for now as a FH rubber on Donic Waldner Legend Carbon Pen. It is not as speedy as some other rubbers such as Xiom Omega, etc. but with better control. It is less spin than the Tibhar Quantum on 40+ ball, but slightly faster. It should be good for many player at various levels at both FH and BH as long as you match it with a powerful (harder) racket and another contrast BH/FH rubber. My friends uses it on Hinoki blades and that seems to work better than my using it on the Waldner pen. Like this rubber very much. It is good for close to table play. It is fast and powerful on attack. I use it for FH on Nittaku Basaltec Outer blade. Powerful feeling, suggest on BH. Minha atual borracha do forhand. Ok, lets face it, Evolution MX-P has definitely earned the rank of one of the best rubbers in the market. It is much more than just a cheaper alternative for T05. It has a soul of its own. That doesnt mean we cannot compare it to T05 in order to better describe it. To summarize, it is faster, harder, it has a longer trajectory and a lower arc than T05. I would say it has 95% of the spin that T05 has and a little bit more control. My impression is that this rubber automatically targets the end of the table, making it really difficult for the opponent to stay close. Recommended to advanced players or professionals. It is still hard to control for beginners. If you are looking for more control I would suggest the ELS version. I don't know how long this rubber can last, but good control and looping. This is the best rubber I have ever used. Nothing to send to the T05, MX-P is a fast rubber, despite this has good control, and much, but much effect, can develop wonderful top-spin. Excellent for forehand. This rubber is very fast. I have only used it a few times thus far but it has been excellent. It has a fairly grippy topsheet, the sponge is responsive. I am pleased with this rubber. It seems to be a cheaper alternative to Tenergy, and it feel very similar when I am striking the ball. I have been using mxp/msx for over 5 month. MXP used to be my back hand, and after reading so much about how good of a forehand rubber it is. i switched it to my forehand. -lightning fast with good technique. -dont need to try too hard to get good spin out of it on service. back hand or forehand. -last very long time. specially the black. the sponge is not very sturdy if you reglue a lot. i have 3 blades. i use it on DHS hurricane KING v1, BTY Cofferlait ALC and Xion Vega Tour. IT IS GODLY on THE VEGA TOUR. all my apponenets have told me my spin has improved 300%, and we are talking just normal strokes and without even trying to make it spinny. I tried Mx-P after reading positive reviews about it.I am really enjoying playing with this rubber.Very similar to tenergy 05.Been using it for the last 6 months and still going strong.It is so affordable too unlike the tenergies.Give it a try and you will love it.Mind you,its a fast rubber so your strokes have to be perfect before you try this one.Moreover,a very quick delivery by tabletennis 11 even in Canada. not a bad alternative to similar fast rubbers. myself and advance players at my club find it cheaper and quite comparative to more expensive rubbers of this range. recently it was on sale 4 for the price of three. Max is a bit faster. All round rubber -you can do literally anything with this rubber. Will be more effective in matches if it were a tad slower.. Sometimes, i found it a bit faster near the table to apply to full body pressure on topspin. Evolution rubber is just as good as Tenergy having used both. Evolution is not over priced like Butterfly Tenergy. For top players, it provides high speed and powerfull spin. Recommended for OFF blades with good control. espero que para las proximas versiones de hules THIBAR sigan mejorando. Gracias TT11 entrega a tiempo como siempre. Good control and for spinny loopers. my playmate uses tenergy 05 , and he tried my evo-mxp. he is very impressed. he said it can be alternative to tenergy. but tenergy has more sinked than mxp. but for me, MXP is very powerful rubber i can beat players who uses tenergy. the spin is very tremendous depending on how you use it. the spin for me is impressive. Good at service and power loop. i use this on BH and FH. very good! One of the best rubber I have had played with. Fast, Spin and Control combination for attack players. I used to played with Tynergy 05 and 64. I love the quality of the rubber for the price. This is a substitute for Tenergy (a rubber that is very over-priced). This rubber may not have the same level of control as Tenergy but it does the job. This rubber is very good for forehand offence.. This is an authentic product. The quality of the rubber is great for the price as it's comparable to Tenergy (grossly over-priced rubber in my opinion). I will buy this rubber and from tabletennis11.com again. Fantastic bh rubber on a carbon blade. When everything aligns and you perform a great bh stroke it's loaded with spin and speed but not too uncontrollable as say T64. This is excellent rubber for Pro but need little more control. I bought it as a cheap replacement for Butterfly Tenergy 05. It is not. I bought maximum thickness, both sides on a Nitakku Violin. It likes this combination. 27/10/2016 Excellent Review by Gary S.
MX-P has the similar properties as the Tenergy class of rubber namely T5. I am very satisfied with the service provided by tabletennis11.com, very very service. especially the racket assembly and the shipment. I needed some time to adapt to the rubber, but once I adapted I had no issues. This rubber is a cannon. Very fast, very spinny. As the rubber is very spinny, it is also very spin-sensitive, but I don't mind as it is helping me improve my spin judgement for serve receives and blocking. As others have said, you must make good contact with the ball, otherwise, the ball trajectory is unpredictable. Early/late timings are punished, so this rubber is for advanced players. As an intermediate-level player, I am contemplating switching to a less demanding rubbber since I don't think I can get everything out of this rubber. That said, it spins backspin like a dream and the pace is blindingly fast. It is the faster, spinnier rubber that I was looking for when I replaced my Joola Rhyzm. The only con would be that it has less control, but it has more to do with myself as a player rather than the rubber itself. Top marks! Love this rubber. Spin and speed with great blocking. My only advice is that on the forehand, it seems to work best with a hard outer ply. The harder outer ply seems to bring out the best spin, speed, and control of this rubber. The weight can be a problem for some. So if you use this rubber on both sides, your blade will be a bit heavier that you may be accustomed to. (FOREHAND) great, but it takes more effort to produce high quality spin and speed. If not hit properly the ball will fly because the spin isn't taking properly with the power. Suggest using less power concentrating on more spin in your stroke. The touch play around the net is excellent though. So serve returns are better. (BACKHAND) = simply AMAZING !!!! Spin and speed are incredible! Close, mid distance, and away from the table the ball has tons of control !! (FOREHAND) = Great control, spin, and speed. These aspects are increased greater than when this rubber is used on the forehand of the Stiga Carbonado 190. The two outer plies of wood on the HL5 interact great with this rubber on the forehand. Power, spin, speed and control are of the highest quality with this rubber and blade combination. Touch play is also beautiful with this combination. Off the table, is where this combination shines! Effortless! Winners can be hit from just about anywhere! The higher your skill level, the more you'll like this combination. (BACKHAND) = Excellent! Excellent in every aspect of the game!! But your backhand from mid distance, to far distance with be so much BETTER! Even better than any Tenergy rubber. Control, spin, speed, power are all increased tremendously! (BACKHAND) = need good technique. This rubber goes as fast as you tell it when paired with a harder outer ply like Koto wood. Close the blade and swing away on a high ball. Spin the logo off the ball when loop driving from mid distance. But of the table you'll need good technique. And you'll need to get used to the feel of this combination. Overall, I like this rubber better than any Tenergy. It's more dynamic (versatile) than any tenergy I've tried. Allow the rubber at least a few days out of the packaging before applying it to your blade. If you apply the rubber to your blade right out of the packaging, and for any reason you have to reglue the rubber. You'll find that the rubber has shrank and will not fit correctly back on the blade. The only way to solve this issue is to allow the rubber a few days of airing out so that it shrinks. Then it will not shrink on the blade, and you'll have no problems regluing it if you ever have to. Best rubber I ever try, good control fast and lots of spin when engage the sponge. Well done TIBHAR and Tabletennis11 !! Performs just as well as Tenergy 05. Just at a cheaper price. Performs just like Tenergy 05. Just at a cheaper price. Love it when it is new. Feel like T05. Good for FH and BH. Very good quality but to me it felt very fast and also quite heavy (compared to T05, T64). But all in all a very good rubber. Really love this rubber. I'm using it for FH and BH with Tibhar CCA7. At the beginning, I was afraid that I couldn't control the rubber due to its sponge hardness and speed rating. But after playing it I find a really good chemistry with this rubber. 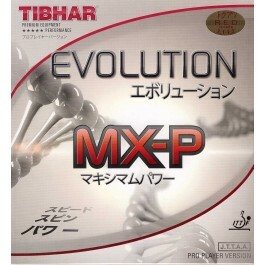 I'm surprised that Tibhar Evolution MX-P give a me a very great balance between speed, spin, and control. It's fast like tenergy, but the control remains there. My rating for this rubber is 10/10. Keep your good work Tibhar !! Comparing with the blue fire M2 it's less spiny and olmost the same speed and control, good feeling. It's a good choice for a bit softer blade, and also tried in BH, It's just a surprise. The rubber is fast and with good spin. It has good quality, and last longer than some other brands. It is little bit harder, but it is powerful for attack. I'm on my third sheet and my previous review is still valid. Now I've tried this rubber also on Yasaka Sweden Extra and Tibhar Stratus Power Wood and it works great from ALL+ to OFF+ blades. I've used a medium coat of Falco Tempo Long Booster on one sheet looking to get 1mm more to fit MX-P on another blade and it got a softer and more pleasant touch and became a bit better smashing, but MX-P don't need any additional boosting to improve it's performance, this rubber is great and suitable for forehand or backhand of offensive players. At first I was reluctant to let go my tenergy 05. Then came a playing partner with MXP on his forehand. I tried his racket and decided to give it a shot. When used with a carbon blade (I use Timo Boll ALC), this rubber is a powerful beast throwing back anything with tremendous speed and good spin. Backspin, loops, floats, chops.. Can handle any incoming stroke. The rubber shines both close to the table and at medium distance. The arc is low but with the speed, the arc is long enough. Highly recommended. If you are a player tilting towards pro level, give this one a shot. Great job Tt11 in getting it delivered in superfast manner without any hiccups. Keep up the great show. You guys rock. Great offensive rubber for loopers that like to play away from the table. MX-P is fast, spiny, hard, mid-high throw, heavy, with good control for such a fast rubber. It's great blocking actively over the table and has enough control on short game, but it shines from the mid distance and away from the table where you can generate great speed and spin without a lot of effort. I was using it primarily on my FH, but since I was not having a great time with MX-S on my BH I gave MX-P a try and this is still there. I'm probably going to MX-P on both wings soon because it just fits well anywhere. I've used this rubber on BTY Viscaria and Mazunov. Great looping tool on both blades, but the Mazunov became too heavy (I'm using max BH/FH). This is the best Tenergy 05 clone on the market. The only reason I don't use this rubber currently is because I switched to Tenergy 80 for more all around chopping game. But this MX-P rubber is fantastic! Plenty of power and great spin. There already so many good reviews about this product and they 've told the story. I think this rubber should be compared to it's main competitor Tenergy 05. Yes amongst all rubbers I tried this is the closest to Tenergy 05 in feel and performance. Moreover it's cheaper, but it is not a Tenergy clone. I have tried both rubbers on Carbonado 190 in max thickness. I've played Tenergy 05 (my main rubber) on many other blades and MX-P on some others. MX-P weight slightly more than Tenergy. MX-P sponge hardness is between 45.7-47.7 according to Tibhar. So yes it varies significantly. Tenergy 05 is 36 by butterfly scale which is 47 in euro scale. But I must say I noticed MX-P sheets I tried feels like having not less than 47 degree hardness. MX-P topsheet is softer than Tenergy 05 I believe due to a pimples structure. Both has great dwell time may MX-P a bit more. MX-P top sheet looks very grippy however I experienced ball slippage with MX-P (on rare occasion) which I never did with Tenergy. I consider both rubbers being high throw however Tenergy 05 has greater throw angle. If you compare the maximum speed I believe they both are more or less equal. May be MX-P has a bit more reserve here, however it's not that big. But regarding the catapult the Tenergy has a greater catapult whereas MX-P is more linear. So you'll get a faster speed with Tenergy on soft (light) shots. But I must say both rubbers allows short play because the catapult is not activated straight away in over the table game. And here MX-P being less bouncy allows a notch safer play. You'll get a bit more spin with Tenergy right away. Even brushing the ball lightly results in a good spin. With MX-P you must engage sponge more to get more spin. Brush looping is possible easily but you will get much more spin when the sponge is activated. Therefore prefer harder blades for MX-P which activate sponge earlier. On full swing both rubbers are almost equal in spin, may be Tenergy wins by a small margin. However in light shots and in over the table game Tenergy gives more spin. MX-P is less sensitive to incoming spin and more linear in speed so it's easier to block with it. With Tenergy you must choose your racket angle with greater precision for a ball to land the table. But when doing active shots I think Tenergy 05 with it's extremely hard topsheet gives a greater precision. Tenergy is always consistent on active shots. However overall in control I will give advantage to MX-P.
MX-P is of course a looping rubber but I find Tenergy 05 is easier to loop or counter loop with. It's hard to explain but it's just feels better, like it was created for topspins. With Tenergy 05 it's easier to lift heavy backspin as well. You must understand me correctly with MX-P you can do perfectly great topspins but Tenergy 05 is just better. But of course you 're paying for it by sacrificing in some other areas. Overall MX-P is greatly balanced rubber that can do it all. Watch Samsonov matches to get an understanding what you can do with it. But if you are only looking for a top end no compromise looping rubber then choose Tenergy 05. In my opinion Tenergy 05 is still the best looping rubber out there if not taking Chinese. The rubber is not spin same Ten, but its acceptable with web price. Very good forehand rubber. Good speed, spin and control. Only issue is the shrinking when regluing. I have it on Nittaku's Barwell. (2.1mm) It's a great combination. I previously played with chinese rubbers, and I'm def not going back any time soon. It's fast but not too much, and the quality of spin and controll are just amazing. To date this is the best Tenergy alternative on the market. MX-P actually has more topsheet tack then Tenergy. The only problem with MX-P is that it's heavier than Tenergy. My 1.9 64 in lighter than my MX-P 1.7 on the same racket. MX-P is also soaked in Dandoy booster so you don't have to boost it at all initially. The speed is great with MX-P! Tibhar Evolution MX-P rubber is an excellent choice since it's considerably cheaper than Butterfly rubbers but performs as well. Thumbs up for Tibhar for making a high quality but cheaper rubber! It generates beast spin, great speed and catapult effect. Also a great high pitched sounded crack at hard contacts. (at least on my blade) I think the only slight con about this rubber would be the weight. (a bit on the heavy side, 73gr uncut). But otherwise the best FH rubber I have tried! The life of this rubber is also 500% more than T05. (I hate brittle T05s). It is heavily boosted and it has been performing very well for 5 weeks so far at 4 hours a week for 20 hours of topspins. Try it to believe it! Well done Tibhar and TT11! I learned and played with Sriver for over 30 years. Every now and then I would experiment with something different to see what was out there in terms of rubber choices, but always went back to Sriver for it's fantastic feel and control. MX-P is the first rubber that ever made me feel 100% sure that I never wanted to go back to Sriver again. It is superior in every way including feel and control. I'm now very curious to try the rest of the Evolution series. Great rubber and I use it for my FH. Good spin and power. I used it on BTY ALC blade and it's perfect match. Good quality, Similar to tenergy 05 but cheaper. i can say that this rubber is one of the best rubber that i tried. very spinny top sheet even on poly balls! I needed a Tenergy replacement and I found it. Attack, counter, occasional chops, you can do everything and anything with great speed, spin and power. Really a great buy. It's a very good rubber! Perfect performance on my viscaria! I like it! MX-P is a killer rubber! I would say that it is not just an alternative to Tenergy rubbers but it is probably better. For those who have yet to try, you should! On top of that, kudos to Tibhar to keep the prices fair! This is a really nice rubber. I haven't used it long enough to notice when the boosted effect wears off, but it has something special about it right out of the package. Powerful and firm sponge. Yet it has a clicky, speed-glue like feeling with a loud cracking sound right out of the package. Very good spin from mid and long distance, but on passive shots, or brushing shots close to the table, its not in the same class of spin as Chinese rubbers or Tenergy. Definitely worth a try! Works great for FH and BH. I have tried in to Inner force ZLF and lately on Carbonado 145. Definitely the best Tenergy alternative. Tabletennis11 makes it a steal with its on their special offer too. All table tennis community search for an alternative for the Tenergys because of the price. This rubber is an excellent alternative. A little bit heavy, but very spiny and fast. You have to "understand" the rubber to have the best results, so practice. You will have no regrets ! very good grip, spin and overall consistency . Control in short game wih latest generation rubbers is better though. Similar quality to 05, powerful, good control, spinny.... but half the price (in promotion)! Almost appropriate on all blades... woody, carbonated, single wood, 5 ply, 7 ply.....simply the best FH rubber. A very powerful rubber suits for attacting players. I used it 4 days a week. When it is new, the rubber can compete with T05 for sure. After 2 months usages, the power especially in spin and control has decreased around 20%. After 6 months, the rubber seems like dead and only remains 60% power. Fast, hard, spinny, allround fantastic attacking rubber which is thoroughly recommended. Very good rubber on my forehand. But too expensive. Best BH rubber in my mind. MXP, T80, T64 are all extremely good as BH rubbers. It has harder sponge then T80 and more solid then T64 in my mind. Накладка мне понравилась прежде всего сочетанием контроля, скорости и вращения! а задержка мяча на накладке, дает возможность играть по месту неожиданно для соперника. Отдельное спасибо магазину за скорость доставки, всего 1 неделя с момента оплаты! Контроль, скорость и вращение! Благодаря задержке мяча на накладке есть прекрасное чувство мяча. Брал в толщине 2.0мм. This rubber is quite heavy. Quite good interns of speed and spin, but still lacks the level control that is required by a penholder to be used as the fh rubber. Maybe used for shake hand blade is better. It's a great rubber for powerful speedo drives, not that easy to do a slow speed looping, too bouncy when try smashing the ball or play the short balls. I use this rubber as FH. It makes my ball faster than other's rubber. I like it. I am intermediate player, use it in 2.0mm thickness on FH (BH is sinus sound) with tibhar sensitec xeon blade. Behaves good on every variations of shots. Most effective at close to midiate distance from table(for 2.0 mm) for skilled players may be good at far distance too. Very controllable, fast and easy to use to. Gluing: i glue it with 2 layers of glue on the rubber and one on the blade. Next time will put 3 layers on the rubber. After 3 months loose properties, regluing may help. When pull it off the blade the rubber get smaller. un producto que ha tenido una gran acogida por su tecnologia y precio. Excellent speed and spin. I like this fast and hard rubber on my backhand. Fantastic Rubber. Its very fast and has good control for an attacking player. 1. Its a very heavy rubber, but could get used to it. 2. You need to use multiple layers of glue to stick this rubber. One layer will not help.